Minister of Social Solidarity Ghada Wali ordered on Saturday EGP 100,000 compensation for the families of those killed in the terror attack on a bus carrying Coptic Christians to Saint Samuel the Confessor monastery in Upper Egypt's Minya on Friday. The minister also ordered EGP 50,000 compensation for all victims who were seriously injuried and EGP 2000 for all others injured in the attack. 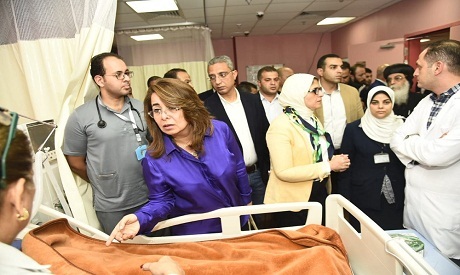 Minister Wali and Minister of Health Hala Zayed visited the injured victims at Sheikh Zayed Hospital in Cairo's 6th October district early today. Meanwhile, Wali stressed that her ministry is following up with the victim’s families to ensure that all their needs are met. Security forces are currently searching for the unknown gunmen who carried out the terror attack. Egypt’s prosecutor-general Nabil Sadek has opened an investigation into the attack.